The zinc chloride in Stay White also has a role in maintaining natural tooth colour. Zinc chloride inhibits calculus formation through multiple mechanisms. 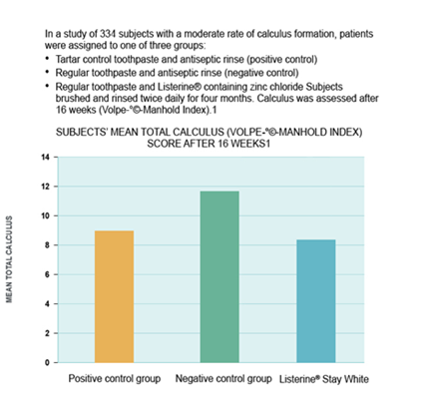 Calculus formed in the presence of zinc ions is less crystalline, softer and less adherent to the tooth surface,4,6 and therefore easier to remove mechanically. By helping to reduce calculus build-up, zinc chloride helps keep teeth whiter. Charles CH et al. Anticalculus efficacy of an antiseptic mouthrinse containing zinc chloride. J Am Dent Assoc 2001; 132; 94–98. Ingram GS Edgar WM. Calcium salt precipitation and mechanisms of inhibition under oral conditions. Adv Dent Res 1995; 9(4): 427–432. LeGeros RZ et al. Zinc effect on the in vitro formation of calcium phosphates: relevance to clinical inhibition of calculus formation. Am J Dent 1999; 12(2): 65–71. Buch JG. Pharmacology ReCa p 2.0 for Bachelor of Dentistry Students. P406. http://www.virtualmedicalbooks.com. [Accessed 22/6/2011].